Spanish authorities said Sunday they had broken up one of the “main” gangs that smuggles hashish from Morocco to southern Spain with the arrest of 12 people. It is the second major bust this month of alleged drug smugglers in the southern province of Cadiz, where drug traffickers are operating in an increasingly brazen manner that has alarmed authorities. “We have declared war on drug traffickers and those who help them,” Interior Minister Juan Ignacio Zoido said in a Twitter post. In addition to the 12 arrests, police seized a submachine gun, ammunition a bulletproof vest and nearly €190,000 ($223,000) in their latest bust, he added. The minister said the operation “has broken up one of the main criminal organisations dedicated to the introduction of hashish from Morocco to the Campo de Gibraltar”, a country in Cadiz province. Two weeks ago police arrested 14 suspected smugglers and seized drugs and boats allegedly used to run stashes of hashish across the Strait of Gibraltar from Morocco. 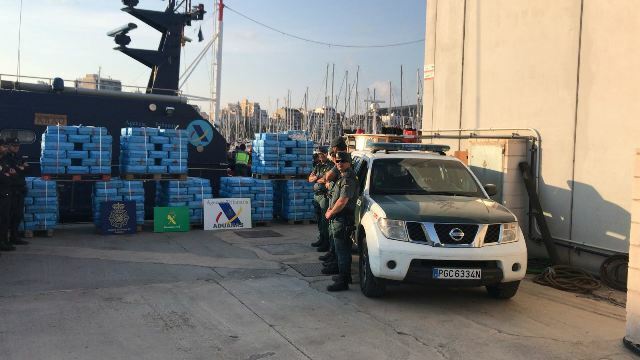 Police announced their biggest-ever cocaine seizure in April, when they found 8.7 tonnes hidden in a container ship that arrived from Colombia in the port of Algeciras in Cadiz. The province, which is just 15 kilometres (nine miles) from Morocco’s northern coast, is the entry point for 40 percent of the drugs smuggled into Spain, according to the interior ministry. Hundreds of people gathered in Algeciras’ main square on Thursday night to protest against the increasingly violent drugs trade in the underprivileged area.